Home Technique 5 Essential Technique Tips For Boxing Beginners! Boxing is a brutal sport, and obviously a very dangerous one. In any sport it’s important to master the basics before you move on to a more advanced level, never is that more important than in boxing as the stakes are a lot higher. You may have that glory moment in your head of the referee counting out your opponent, but before that happens, there is a lot of work to do. Boxing has a few important fundamentals that will put you on the right path to enjoying sparring, winning fights and having fun with the great sport. While it can be tough, boxing can also be extremely rewarding. While you may wish to be an Anthony Joshua or a Gennady Golovkin, even they had to master the essentials before they could eventually become world class fighters. Here we look through the most key aspects that will you will need to start becoming a great boxer. One of the most fundamental parts of boxing is the guard. While you may see many variations in boxing, it’s important to know the basics. Every boxer has a slightly different guard, but that can be due to various reasons such as weight and speed. We saw in the Lucas Browne vs Dilian Whyte contest the importance of a proper guard. Whyte was the quicker and better boxer, so therefore Browne had to be careful. For some reason however, Browne kept his guard low. That meant that Whyte was able to pick him off with straight shots and hurt him. This eventually led to a huge cut opening up and a stream of blood running into the eye of Browne. He still didn’t keep his guard high and the blindness in his eye meant that he couldn’t see Whyte’s hook coming, and had to leave the arena in a stretcher. It showed the importance of keeping a high guard. At the start, at least, you’ll want to make sure that your guard is high and each of your gloves are protecting both sides of your chin. 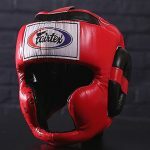 You’ll want to make sure that they are held loosely in front of your face so that you can deflect any incoming punches easily off your gloves. As soon as you’ve thrown a punch, you will want to make sure that you pull your glove straight back to that high guard and back to your chin. If you can’t then you’ll easily get caught out and find yourself on the receiving end of a clear shot. You’ll want to make sure that you stand up straight and don’t crouch forward when getting punched. As you gain experience you’ll get a lot more comfortable with your own style and judging distance, but if you keep your hands low as a beginner, you’ll get punished. As you hold that high guard, make sure that your elbows are tucked into your body so that you can evade any body shots. You might look at a fighter like Floyd Mayweather and wonder how we could change his guard, and hold his hands low, but that takes years of lighting fast reactions, knowing your opponents and experience. Copying your favourite fighter might sound like a good idea, but you need to find your own style, and that starts with staying behind a solid guard. There is an art to boxing and there is a lot more to it than just trying to knock someone out. If you get into a ring then you probably have that perfect image in your head of landing a straight cross on the chin of your opponent, and the referee waving it off as your fellow fighter can’t make the count. Like with many different sports however, you need to have a base level of control and experience before you can deliver your full power. If you picked up a golf club and tried to hit a ball 350 yards on the first attempt, you’d probably swing yourself off your feet. The same can be said for trying to hit a six in cricket, or hitting a 40 yard screamer in football. Without the correct form and technique, you lose all shape and end up embarrassing yourself. In golf that could mean pulling the shot, in cricket losing your wicket or in football missing the target. In boxing, it could mean that you end up getting knocked out. At the start you want to be controlled and put a lot more thought into your defence and your movement rather than trying to knock someone out. Someone who is wild would just be picked off and dominated by a better fighter, so it’s important to focus more on your skills. Not only can going for the knockout before you’ve mastered the fundamentals be dangerous, but it also takes up a vast amount of energy which can make you start gasping for air. The term ‘punching yourself out’ comes from getting carried away in the ring and not thinking about how much energy your body is using up. Staying behind a good jab is important to any boxer. Once you know how to do that, you can build on it. The knockout will come from controlled punching and the opportunity opening up after clever boxing. If you chase it as a beginner, it could be very dangerous. There is no boxing without fitness. If you’ve ever done something as simple as a boxing fitness class, shadowbox in your living room, or a sparring session, then you’ll know how tiring boxing is. Getting into the ring and having a fight takes it onto a whole new level. The movement with your feet, punching and the nervous energy can take it out of you extremely quickly. If you go into a ring with no fitness, then you will barely last more than a round. Getting through a three round fight requires a higher level of fitness than you thought possible. As the rounds increase, so does the need for boxing fitness. It can be the difference between being a good fighter and a great one. If you’re in a fight and lose your fitness when your opponent still has theirs, then you’re going to be in huge trouble. It puts you in a very vulnerable position. When your fitness goes, everything goes. You won’t be able to keep your guard up, and you won’t be able to through any power punches. You have to go into survival mode and either wait for the end of the round, or the end of the fight. You’ll probably start breathing through an open mouth which can open you up to danger. Once you have a fit fighter against one that has ‘gassed’, then there is only one winner, and it often isn’t pretty. Boxing requires a high level of cardio which is best worked on with sparring sessions and boxing specific training. On top of this, any high intensity fitness work would be a huge help which can carry you through a fight. If you’re a beginner, then weights aren’t important, building your fitness is a lot more important than building strength. Doing bench presses in the gym won’t help you during a fight anywhere near as much as going on a treadmill will. At the start focus on your lungs, not your muscles. Breathing the correct way in boxing is vital for a number of different reasons, as it’s unlike any other sport in that respect. It’s not just about breathing to get the right amount of oxygen into your lungs, it’s also about breathing to make sure that you don’t get hurt. There are a few vital things to remember when it comes to breathing and boxing, with the first being to breathe in through your nose. 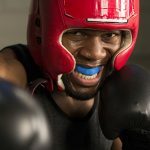 There is a temptation in any high intensity activity to breathe through your mouth, but in boxing this can be dangerous as getting punched on the jaw is a lot more dangerous with an open mouth than a closed one. You’ll see some fighters breathing through an open mouth late into a fight, but this is generally because they are so fatigued that the basics have left them. Breathing in through your nose not only regulates your breathing, but keeps you protected. In terms of breathing out, it can be done either through your mouth or nose. If it’s through your mouth, then it needs to be when you are punching and done in shorter exhales with as closed a mouth as possible. This will help you to breathe at the right time, but can also stop yourself getting hurt. Getting hit in the body with an expanded diaphragm and full lungs will hurt a lot more than if you get hit without a body full of air. Breathing properly will keep you controlled throughout the fight and away from danger. Practicing to correct way to breathe should not be done just in the ring, but in sparring and also any other types of exercise. When you eventually get into the ring, you want your breathing techniques to become second nature so that you can focus on the other aspects of boxing. Just like with your guard, in the professional boxing ranks you’ll see many fighters have a different level of head movement from a whole different range of fighting styles. Roy Jones Jr. was known for holding his head out to his opponents with his hands down by his side. If you tried to copy this style you’d most likely end up with you back on the canvas, looking up at the ceiling. He could do that as he had supreme reflexes and loved showboating. When it came to attacking and defending however, he was always moving his head. Check out this awesome video on head movement! You’ll constantly get hit unless you move your head, but this doesn’t involve swaying it from side-to-side in a dramatic motion. You want to make sure your eyes are focused on your opponent and never leave the target, in order to do this you want short, but constant, movement of your head. Dramatic movement is a last resort to get out of trouble as you can’t set yourself up for a punch unless you’re in control. The right head movement involves moving it when you throw a jab, with subtle movements, and constantly moving when you’re trying to get punched. When walking forward, you shouldn’t do so in just a straight line and should be moving your head in and out of that straight line. If you don’t you’ll be an easy target and your opponent can just tee off knowing where your head will be. Moving your head while still maintaining poise and balance in a punch is a talent to be learned and takes time to master. In the heat of the battle though it’s important to remember just to keep moving, the jab becomes an excruciatingly easy punch if a boxer isn’t moving their head. So always keep that head out of line and don’t give your opponent an easy shot. It’s called boxing, and not fighting, for a reason. Many call it the sweet science, hit and not get hit. All that starts from learning about the basics and making them second nature. Before you throw a shot in anger, you’ll want to make sure you have a solid guard. Before you try and knock out an opponent you’ll have to learn how to throw a punch properly and set up your opponent first. Unless you want to get knocked out, you’ll want to make sure your fitness is up to scratch to last the distance. To protect yourself and control the fight, you have to learn how to breathe the right way and to avoid getting hit you need to constantly move your head. The boxing basics are vital to give yourself a platform on which you can improve and get better. Before you worry about speed or power, there are more important things to focus on. Once you’ve mastered them, then you can have a lot more fun in a sport that can be dangerous, but extremely rewarding. Previous articleHow To Breathe When Doing Push Ups, Properly! Next articleMuscles Used In Punching: The Muscles To Focus On!